This exhibition catalogue lists known works of the nearly forgotten Julian O. Davidson of South Nyack. 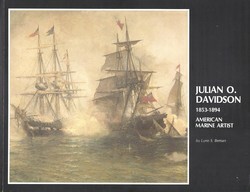 A leading marine painter and illustrator in his day, he devoted most of his career to painting historical American naval scenes. The volume includes a history of the Davidson and Merritt families and of the Nyack Rowing Association.